Updated July 23: This event is NOT happening at Seattle Center as announced in the press release below and as we originally reported. Apparently that plan changed. This event will take place at the Elysian brewery in Georgetown as it has for the past few years. We will continue to update as more info is available. Original Post:I don’t want to bring you down, but summer will not last forever. Don’t shoot the messenger; it’s actually Elysian Brewing that’s bumming you out with all this “autumn” nonsense. We have news about this year’s Great Pumpkin Beer Festival. It’s silly and whimsical, which is a good thing for a beer festival. It has become one of Seattle’s favorite beer events. Still, the way this thing has blown up is a bit surprising. The Great Pumpkin Beer Festival continues its mind-boggling growth trajectory. They are expecting to pour more than 80 different pumpkin beers from breweries near and far. The 2014 version of GPBF happens on October 3rd and 4th. Tickets go on sale on August 1st. Keep an eye on the official website for more information. Here’s the message from Elysian Brewing. It’s the Great Pumpkin’s 10th Anniversary, Charlie Brown! It may be barely mid-summer, but pumpkin season isn’t far off. Blame some of the big national producers if you need a scapegoat–or the fact that people just plain want it–but the delicious reality is that Elysian Brewing Company’s 2014 lineup of pumpkin beers will be hitting shelves beginning with its flagship pumpkin brew Night Owl this August 1. Brewed with over seven pounds of Oregon pumpkin per barrel and spiced with the classic pie blend of cinnamon, nutmeg, ginger, cloves and allspice, Night Owl will be available in six-packs, 22-ounce bottles and on draft in all of Elysian’s markets throughout the Northwest and beyond. Never a crew to settle for one of pretty much anything, Elysian will be issuing three other beers to round out its Pumpkin Patch selection in 22-ounce bottles and on draft. Two Great American Beer Festival silver medal winners, The Great Pumpkin Imperial Pumpkin Ale (2007) and Dark o’ the Moon Pumpkin Stout (2010) are back by demand, and this year they’re joined by Punkuccino, a spiced coffee pumpkin ale, one of last year’s popular favorites at Elysian’s Great Pumpkin Beer Festival. Look for them in single bottles around September 1. 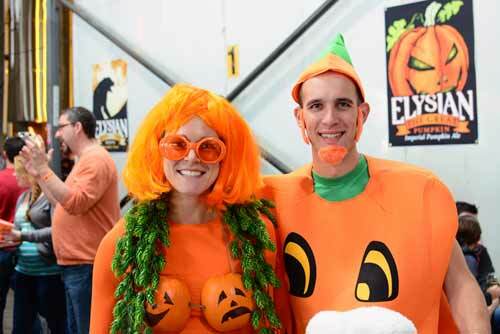 The first Great Pumpkin Beer Festival thrown by Elysian Brewing Company back in 2005 began as a lark, a way to celebrate the silliness that is pumpkin beer. A mistake brewing one of the Elysian pumpkin beers resulted in the idea that with just a couple more, and some invitations tendered to local breweries, a hundred or so pumpkins for carving, a pumpkin full of beer and some pumpkin-themed food from the restaurant on Capitol Hill, something like a festival could happen. The result was a line out the door for ten hours, and the founding of a tradition. Each year saw the festival–the crowds, the lineups and the sheer number of beers–further outgrow the Capitol Hill premises and move on to the Airport Way production facility, and last year’s joyful mob scene begged the question: What’s Next? This year GPBF will be held at Seattle Center, right in the middle of it all. More than eighty pumpkin beers are expected to be available, including twenty or so from the mad brewers of Elysian and their collaborators. The event will be produced in part with local indie radio stalwart KEXP, themselves celebrating moving into more spacious new studios in Seattle Center. DJs Riz Rollins and Stevie Zoom will be spinning at the fest on successive days. Giant pumpkins galore will also be on hand, scooped, scorched, sealed, conditioned and tapped, provided through the joint efforts of Elysian and Krainick Dairy Farms in Enumclaw. Once again the festival will be 21 and over. Look for some very special brews from some breweries whose beer you may never have had. I want all the pumpkin beers. All of them! It’s also the same weekend as Yakima Fresh Hop. Everything good always happens at the same time. I love me some fresh hop beers but Boneyard is doing a pumpkin beer this year, so I know where I’ll be that day!! Thank you Rachel, we updated the post as soon as Elysian made the announcement, but you beat us to it. This event will be at the Elysian brewery in Georgetown and not at Seattle Center as originally announced and reported.